Phil Steele, the guru of the obsessive, can't get enough college football fan, is filling the summer with pre-season all-conference teams and the like. His All-MAC team came out last week and has some prominent notices for some of the Falcon players. 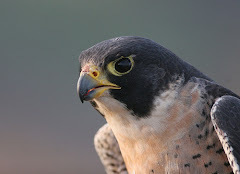 In fact, he has 17 Falcons on the list which is the most in the conference. UT was second with 14. Even with 17, I think BG's corners could have gotten a little more credit. For this to be a special team, they need Shaun Joplin to earn that 4th team designation and Gallon to earn higher. The uncertainty over Samuel is obviously impacting the RB position. Nothwithstanding that, BG was 7th in MAC play in yards per carry last year, and we'll need a top 5 running game, even if we spread the carries out so much that no one gets honored individually. 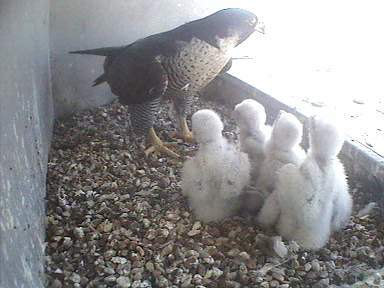 The Falcons have lined up two more verbals for the football team. The first is Alex Thomas, WR, of Hollywood FL. He attends Chaminade-Madonna Prep School and the Sun Sentinel says he is the 9th best WR in the county and the 48th best player overall. I can't find any season stats from the end of last year, but at one point he was leading the team with 8 TDs and 31 receptions. He was second-team all-Broward last year, as a junior. He had some impressive offers. Numerous sources indicate that he had actual offers from Akron, Appalachian State, Cincinnati, Kent State, Marshall, Minnesota, Utah State and Western Kentucky. If we truly beat out Minnesota and UC, that's a good sign. Time will tell, but this is a great get for us and one we will have to watch closely. The other is Jared Coker, OL, of Ashburn VA. Lineman are always tough to find information on...he's good sized at 6'3" and 290 lbs. He had offers from Charlotte, Kent, UMass and Old Dominion. He was first team all-district as a junior at guard. No idea where we might be projecting him, but he also looks like he can be a good one for us. UPDATE: Here's a local story about Coker...he was actually all-state. That leaves BG with six verbals. The Falcons have their assignment and they will be travelling to Louisville to play in their sub-regional. They are joined by two big names in college baseball--Oklahoma State and Miami (FL). BG will play Louisville at 6 pm on Friday, and the game will be carried on ESPN3. It is a double elimination tournament and the winner goes to a "Super" regional to play for a spot in Omaha. Louisville is a very strong team, as you would expect. They are 46-12, 20-4 in the Big East. They did not win their tournament and have entered as an at-large team. They are ranked #15 in the Baseball America rankings, down from #10 after an 0-2 week. Prior to that week they had won 16 straight, including a 3 game sweep of Pitt, who was also ranked. 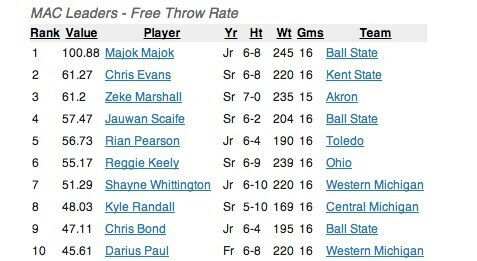 Here's BG's record in the event, from the bgsufalcons.com website. This will be the fourth trip to the NCAA Tournament for Bowling Green all time, as they have compiled a record of 2-6 in such games. In 1972, the Falcons made their first appearance in school history, earning a 2-2 record. In the first ever NCAA Tournament game for the Falcons, the Orange and Brown defeated Northern Illinois 2-0. They would follow that up with a 7-5 win over Central Michigan. 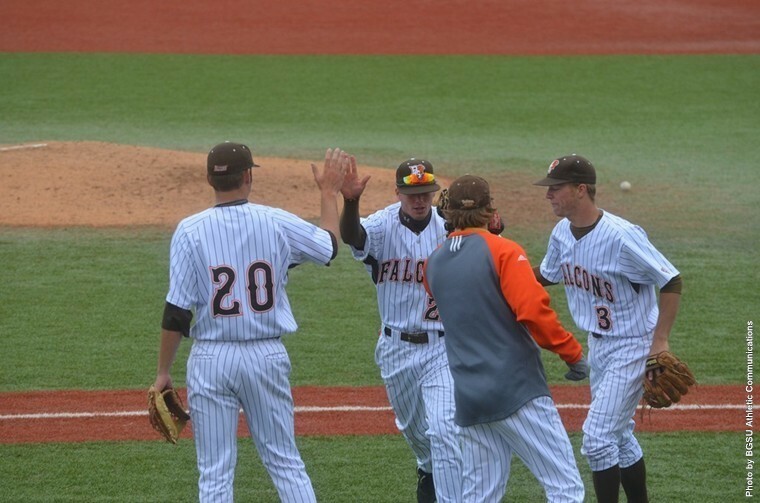 Needing just one win to be crowned as District IV champions, the Falcons would lose two straight games to Iowa and fall just short of a College World Series appearance. Anyway, the first step is to get onto the field and get your shot. Go Falcons! Champions! For the first time since 1999, the Falcons are heading to the NCAA baseball tournament as MAC Champions. This is a great story and I hope everyone who hasn't heard it takes the time to find out more. BG was 3 outs from being out of the tourney, and then they made the tournament, hit a little run over in Avon, OH, and ended up coasting to a win in the championship game. College baseball in the north is struggling and BG has had it share of moments, but led by Danny Schmitz, today they reached the top agin. Huge congrats to the baseball team from throughout the Falcon nation!! baseball championship! They are having a great tourney. Go Falcons, make us proud!!! A little while ago, the USA Today ran a story that is part of its ongoing examination of the financing of college sports. Drawn from public data, it gives a picture of where the money comes from for college sports. 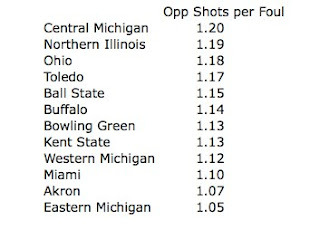 The data for Bowling Green--and most of the MAC--is sobering. BG gets about $20,731,000 as athletic revenue. Expenses were $18,387,000. This gives BG the 109th largest athletic department. That isn't the sobering part. Of the $20M in revenues, only $1.37 million comes from ticket sales. Student fees, on the other hand, account for $12.2M and other school funds for $2.2M. Which means that BG's athletic revenues are subsidized to the tune of about 70%. There's some contributions ($.9M) and $2.5M in rights licensing. I found this just staggering. I guess I should have known, but it just says a lot about where we are with college athletics that schools the size of BG are subsidizing athletics by 70% of total revenues. Just for example, when people wondered why there wasn't more of a concern for ticket sales by letting Coach Orr return for what is almost certainly a lame duck year...and the answer is that tickets make only a very marginal difference in revenues. Also, I think that it is worth noting that BGSU students are supporting athletics by a ratio of 11 or 12 to 1 when compared to ticket holders. Those of us who are fans owe them a debt of gratitude, because without that subsidy, athletics at BG would have a zero percent chance of sustaining themselves. Some of these fees are borrowed as student loans and they have no choice about paying. As you look at college athletics, you have to begin to wonder if it isn't beginning to collapse of its own weight. With the O'Bannon case sitting out there and then the proposal to pay athletes a stipend and then looking at BG with 3 major sports, you get an idea how things are getting to be a struggle. I do think that you are going to see the largest school finish off the deal and move into their own division. BG might spend less, and that might not be all bad. But, the next time you are tempted to say something like "the ticket holders are supporting the program" or you threaten to take your ticket dollars elsewhere, you might want to keep these figures in mind. Again, this is not an indictment of BG---this is the business model for most of our conference--but it does help us see exactly how little voluntary financial support the programs get. Now that we are firmly entrenched in the off-season, I thought we might take a minute and look at a couple of former Falcon men's players who are enjoying professional careers overseas. The first is Scott Thomas. He received all-MAC honors at BG and scored 1,000 points for his career, along with being among the most versatile players in the program's recent history. He is playing for the Cuxhaven BasCats in Germany's ProA league, which is their second ranked league. (Cuxhaven is in extreme northern Germany right on the North Sea--near Hamburg, Bremen....and Denmark. Anyway, Scott is having huge success. He is scoring 19.7 PPG and getting 6.4 rebounds. He is shooting 59% from the field. He is the leading scorer in the ProA league. I hope he's enjoying the experience of living abroad as much as he is enjoying success on the floor. The other player is Otis Polk. When last we checked in with Otis, he was playing in England. He has taken his game to South America in the meantime. This story is from about a month ago and it says that Otis has resigned with Montevideo (Uruguay). He is listed as playing at the very imposing height of 206 cm and has been succeeding down there, based on this. In 2011-12 he opened the season with Montevideo, playing 26 games in the Uruguayan League, averaging 11.1 points, 14.1 rebounds (third in the league), and 1.8 blocks (fourth in the league) per game. I have seen some places where it indicates Dee Brown was on a roster, but I have not been able to locate any results for him yet. Let me know if you have some info I don't have. Anyway, it is always good to see our players enjoying success after their college career ends. BGSU standout and first-team All-MAC performer Kamar Jorden is getting another NFL tryout, this time with the Indianapolis Colts. Jorden had a tryout with the Vikings but broke his hand during training camp and was released. He has been playing for Spokane in the AFL, where he is among the top 10 receivers. You can see what he said on Twitter. Best of luck, Kamar! 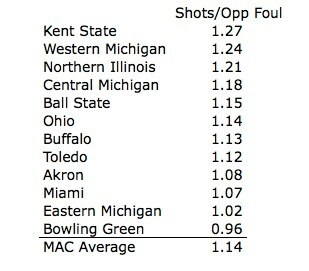 One of the things I was interested was seeing how fouls play into the production of teams in MAC Men's Basketball. I wanted to see, on a tempo-free basis, which teams drew the most fouls and which teams fouled the most. These are MAC games only. A caveat. I understand that there are offensive fouls but most fouls are on the defensive end and this analysis treats them all as defensive fouls. Below is how you do at getting fouled. It will not surprise anyone that BG is last in this measure. BG simply does not have the playmakers that you need to get fouled a lot. If we had one it was Calhoun, and he was normally double or triple teamed. Anyway, the MAC average is for a team to have its opponents commit a foul a on 28% of its offensive possessions and BG was at 23%. There is not a lot of variation here. Seven of the 12 teams are one percentage point above or below the league average. 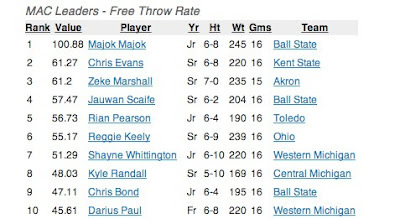 Ball State was led by Majok Majok, a virtual free throw machine who shot more FTs in MAC play than FGs and led the nation in free throw rate. (See below). The other thing I was interested in was what kind of fouls they were. Not all fouls are equal. A shooting foul nets 2 FTs which is better than a foul away from the basket. (A stat that kept track of +1s would be great). There's also the issue of teams earning their bonus shot, but we can't really factor that out. Anyway, to measure this I took the number of free throws a team took and divided it by their opponent's fouls. 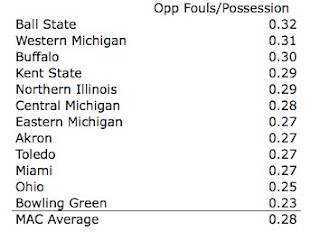 The average MAC team got 1.14 free throws per foul. There is a little more variance here. Kent was clearly the best and I would say they were earning a lot of 2-shot fouls. WMU I suspect benefits from being in the bonus a lot. I was surprirsed to see NIU and CMU this high. 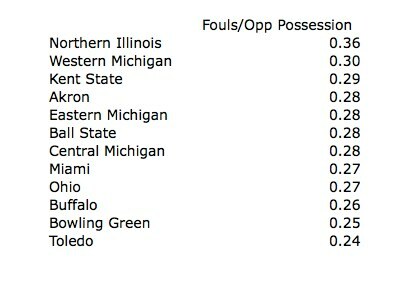 Once again, BG not only had the fewest fouls but the least productive ones. Flipping around now, we can take a look at what teams did with their own fouls. The Falcons were good at not fouling. Remember, the average is 28% of possessions, so BG was well below that. If you recall, this was the strongest part of BG's defensive game--and a defensive game that was actually pretty good. 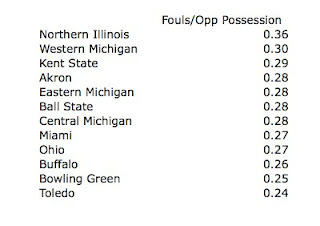 NIU committed a lot of fouls, probably both because they are bad and because they were losing a lot. WMU plays physical. The remainder of the teams were all clustered right around the average. One other note...if you are in the conspiracy theory school of refereeing, this should clear it up. Foul calls are pretty much well distributed. Now, you can get philosophical and say that Akron (just to make up an example) fouled A LOT more but didn't get called. I don't see it that way. Finally, how unproductive are your fouls? Here is the one chink in BG's armor as they are just a click below league average. Beyond that, you can see that the MAC's two worst teams gave up the most shots per foul, but OU and Toledo are the next ones down. As with the other side of the ledger, there is more disparity here than there is on the pure number of fouls. Finally, to look at individual free throw rates, which is free throws made per offensive possession. Courtesy of statsheet.com, you can see the players who got to the line a lot based on the number of times they had the ball. Majok Majok led the nation in this category. Note three BSU guys in the top 10. Chris Evans had a monster conference season. Finally, only 4 of these guys will return to the MAC next year. The Internet provides us the news this morning of a 4th Falcon verbal....pocket passer Cody Callaway of Midview HS, located south of Elyria between Oberlin and Strongsville. Coach Clawson says we want one QB in every class and if that is the case, this would be the guy. He had a very productive junior season, throwing for over 2,000 yards and being named Divison II first team all-state. 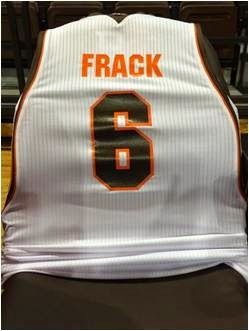 He had offers from BG, Toledo and Buffalo according to cleveland.com. He was also the district's offensive player of the year in Division II. Other internet research indicates he started at QB as a freshman. He's athletic--he also has D1 offers in baseball--and he's tough....he played the season on an injured ankle and he played the last three games with an injured finger. He certainly appears to be a very productive HS player. He's in Division II, which means he isn't playing the largest schools but is in the second largest division. (Zac Dysert played at Ada which is Division VI). You have to like everything you see about him and he had options, which is a high five to our coaching staff. Welcome to the Falcons Cody. Updated on May 6: Here is a story on the commitment in Cody's local paper. Note again the strong impact our coaches are making in the recruiting process. Congratulations to all the graduates of BGSU today. May these years be a springboard to an exciting and fulfilling life and may BGSU remain in your heart. One note...Freddie has technically never graduated. Dude! From our dear Bowling Green. As thy name we praise.